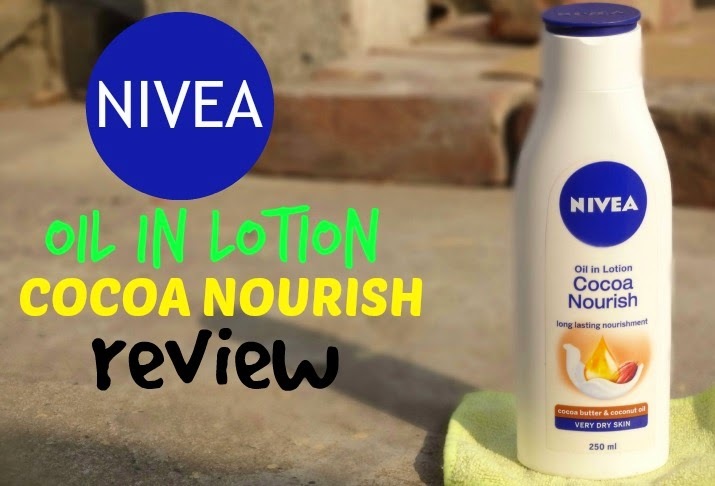 Nivea Oil In Lotion Cocoa Nourish Review - A Boon For Very Dry Skin? Product Description- This new-age body lotion has the goodness of natural oils and a fast absorbing lotion formula that provides deep nourishment for your skin while keeping it soft and smooth all day long. Enriched with coconut oil and Cocoa butter, it provides deep moisture and smoothes away dullness. The formula with hydra-IQ, reactivates your skin’s own moisture network to give 24 hour moisturisation with just one use. Shelf Life- 30 months from Mfd. It comes in a nice shaped bottle with a stylish cap, that is not so tight and thus might open accidentally in your handbag. The packaging is a bit bulky and currently, smaller versions of this are not available. Thus, carrying this with you during travels can be slightly risky. The body lotion is thick and white in colour with a strong fragrance with hint of coconut. I find the fragrance a bit too strong and I think it should be toned down. The fragrance reminds me of Parachute Advansed Butter Smooth Body Lotion. I have been using this for a long time now and one this that I have realized is that a very small amount of this goes a long way as it spreads easily onto the skin. This absorbs within a couple of minutes and keeps my skin hydrated for 4-5 hours and then I feel like reapplying this nivea body lotion. For the quantity, I think that the price is justified. Also, this actually nourishes my skin and my skin has become a lot smoother and does not feel too stretchy now. Of course, the effects are temporary but I feel that this works! It is free from colorants, ethyl alcohol and animal-derived ingredients which is amazing. What I like the most about this body lotion is that it does not leave behind any greasiness or any oiliness on my skin. Now, that is really something great about this. I do recommend this to all of you and I would definitely think about repurchasing this. Final Verdict- I would totally ask you all to try this out as this is one of the best body lotion available in India and lives upto its claims. Would suit all from very dry body skin type to oily body skin-type. I love this and the way it keeps my skin moisturized and happy! Love Nivea for dry skin problems ,would definitely give it a try, Arpita .